If you’re in the market for a popular compact SUV, you really need to check out the new Ford Escape. This compact SUV offers the performance of a full-size SUV with the comfort and economy of a car. 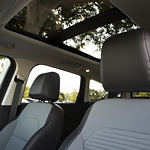 Another bonus of the Ford Escape is the many exciting amenities it offers. Stop at Ron Carter Ford to check out the Ford Escape and see if you don’t agree! The ergonomic heated steering wheel will not only feel comfortable on long drives but will also keep your hands warm on even the coldest days. The HID (high-intensity discharge) headlights use less energy than traditional bulbs but provide brighter lights that last much longer. Compact SUVs have become increasingly more popular for drivers and families who want the room of an SUV without paying a high price. The various amenities make the Escape a popular choice. Come to our dealership and take the Escape for a test run.